Shown below are some examples of my Location recording and post production work. If required I can provide more examples on request. Some short films that I have worked on are currently being submitted to festivals, so unfortunately are not available for publishing online at this time. Reboot is a short film I worked on in March 2012, and then carried on the Post Production Sound for throughout the summer of 2012. 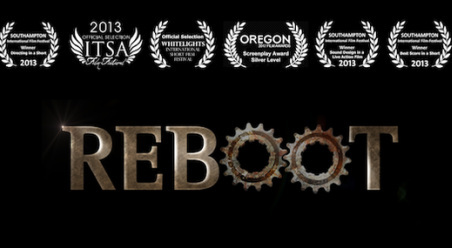 Reboot is currently making it's way around the festival circuit and has been screened at several festivals Internationally, and won a number of awards including Best Sound in a Live Action Film at Southampton International Film Festival. This video was commissioned by the University to promote the Open Days so as to attract more students and encourage them to take part in the event. Working as Sound Recordist with the production company Contrapunto, I recorded all sound for the shoot, whilst also providing some sound editing assistance in the post production of the video. During my first year at the University of Sunderland in 2010, I sought out and joined up with a 3rd year dissertation group and played a major role of Sound Recordist and Sound Designer in addition to my own work. This film went on to win an award at the RTS thanks to the hard work of The Rink Pictures cast and crew. During my time on the Audio Engineering Diploma course at SAE Liverpool, I completed a Post Production Assignment which required us to acquire and design all sound for a 1 minute game trailer. I found this assignment both inspirational and enjoyable and it led me on to pursue a career in TV and Film sound. This project was edited and mixed in Protools HD using a Digidesign Control 24 Control Surface, and having been initially mixed for 5.1 Surround Sound, I have taken it down to Stereo for viewing via the website. This project was a success and received a distinction grade of 98% in 2009. This promotional video was shot over 3 days with Superkrush, a production company based in Newcastle. All location sound was recorded by myself including on screen interviews and presenter dialogue on screen. In my second year of University, I made this documentary with the help of a few others on my course. The Documentary itself was Shot and edited by myself, and all Sound recording and mixing by myself also. This film has been used to promote the Street Pastors throughout Sunderland churches in the area and was an interesting and fulfilling experience to produce.